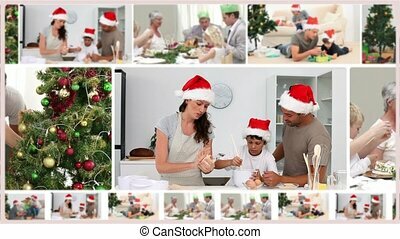 Montage of families celebrating some moments together at christmas. 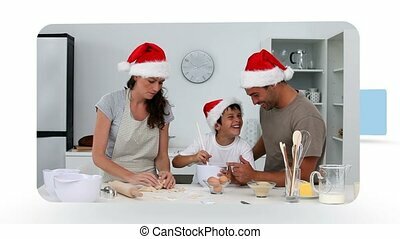 Beautiful big family sitting at the table, celebrating Christmas together at home. 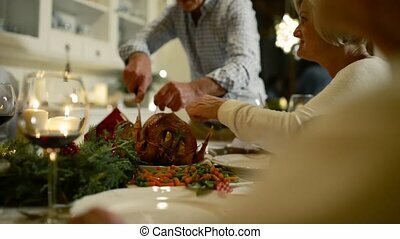 Father cutting roasted turkey. 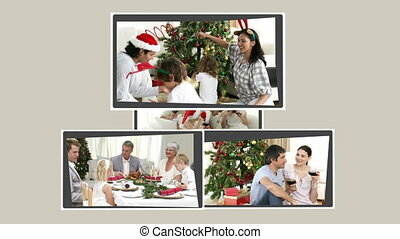 Joyful daughter and attractive mother kissing their handsome father over Christmas decorated interior. 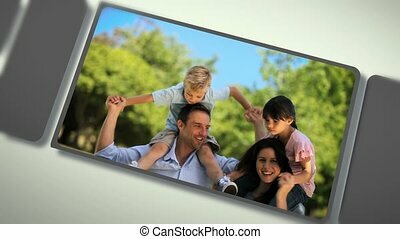 Portrait of affectionate family with little cute girl spending great time together on xmas eve at home. Dolly shot. 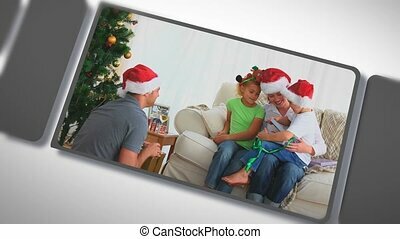 Portrait of positive young family with lovely daughter waving hands and smiling over Christmas decorated room background. 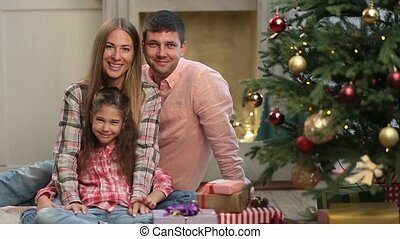 Attractive parents and little girl sitting together near xmas tree during winter holidays, looking at camera and waving hands. 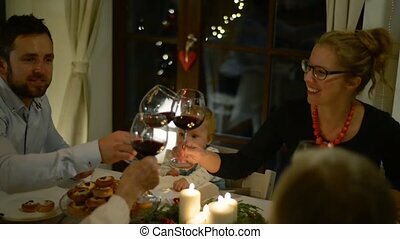 Beautiful big family sitting at the table, celebrating Christmas together at home. Illuminated Christmas tree behind them. 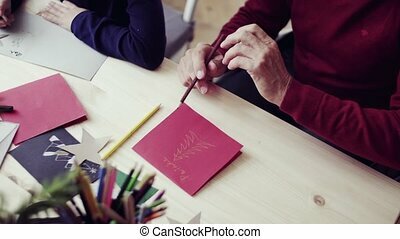 A top view of unrecognizable small girl and her grandfather sitting at a table, writing Christmas cards together. 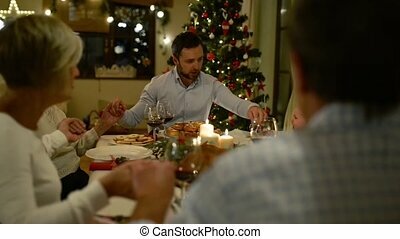 Beautiful big family sitting at the table, celebrating Christmas together at home, holding hands, praying. Illuminated Christmas tree behind them. 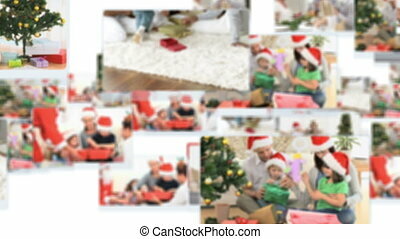 Loving couple dressed in sweater and scarf holding gifts in a Christmas furnished room. 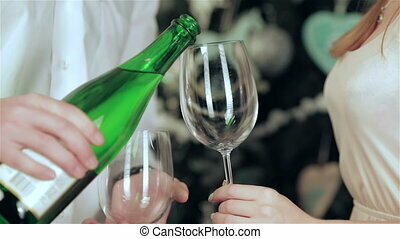 Young couple in love man and pretty girl wearing sweater and scarf at home. 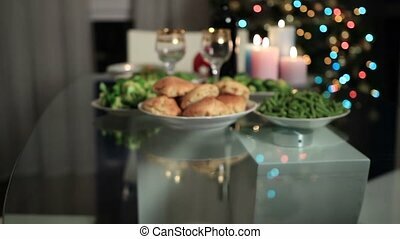 Close up woman's hand serving bowl of salad on festive table over blurred decorated Christmas table setting and Christmas tree bakground. 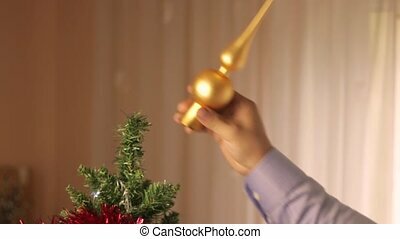 Family celebrating Christmas Eve together at home.